I picked up the Merkur from my dad because I was focusing on some major new home reno projects in 1990 and my Ford Mustang, having been crashed into the trees in Stanley Park, was no longer in my life. I was also in the middle of a failed attempt to build a kit car with the drivetrain components rescued from my Mustang. Finally, I needed some mid-life 'reliable family transportation' (what was I thinking?) and the Merkur looked like the ticket. Boy was I wrong. 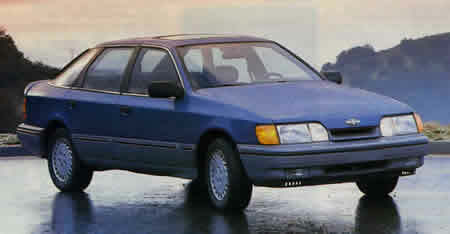 The car was indeed advanced for its time, and it did offer a long list of standard luxury features in the form of a European sedan for a reasonable price, but it wasn't well supported as an odd-ball European Ford product lost in the Canadian outback, costing a fortune to repair and service. I was hit with a few major repair bills for items that were just starting to wear out and it was costing me 3 times the amount for replacement parts that it should have - and everything had to be shipped into town which created long delays in getting things fixed. In retrospect, the concept behind the Scorpio was to create a high quality BMW competitor and in many ways this car succeeded with its high level of luxury and its many advanced features (for its day it was certainly at the front of the pack). This article from Car & Driver says it all . . .